Right now the name of the game bug wise is either Beatis or Midges. 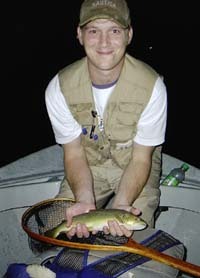 Target the flats and slow water and look for the tell-tale rings. 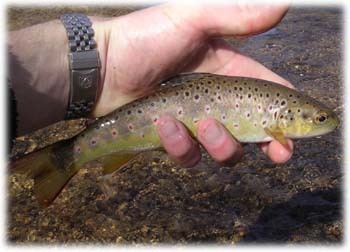 Hitting your local water during the heat of the day will also help in cashing in on the hatch. 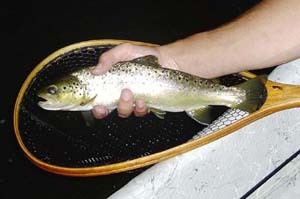 And even if you notice some risers, try to distinguish if the trout are taking duns or emergers. Just because you see a ring, does not mean flies off the top are being eaten. Splashy rises are a dead give-away for this. 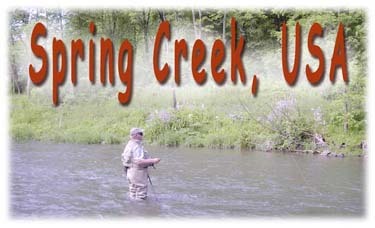 Be sure to check out the Nitro on our patterns page - it is a deadly imitation of an olive emerger. It is pictured at right. Weather pending - this week, we have our first outing of the year. We will have to wait and see what mother nature has in store for us come Monday as we are in store for another soaker..it is doubtful though the streams will weather this storm as well as the one last week. Water temps are still very cold - mid-forties. 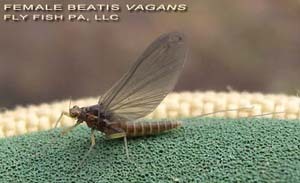 This beatis vagan was observed on a SE PA limestoner. actually it is more like all of the time. Nevertheless it is great to see the fish moving about. The suckers are also all schooled up. As of late a bead head nymph has been the fly of choice. A good fly to use would be a similar pattern to the caddis worm we recently posted on the Patterns Page. We will be at TCO Fly Shop this weekend to give a Lehigh River Presentation. The presentation is both educational and informational. We will talk about flows, patterns, fish, access, methods, rafters, bugs and what all of us can do to take the Lehigh up a notch.